A new exhibition has just landed at the Design Museum. Home Futures presents visions of domestic futures from 20th century architects and designers against the latest innovations we now fill our homes with. The question is, are we living as once predicted? Throughout the 20th century the home was a place of social and technical change, as well as a testing ground where designers and architects imagined new, revolutionary ways of living. Many of the projects on show anticipated our current lifestyles, although some of the ways in which these were depicted still appear somewhat surreal to us. Home Futures is centred around six main themes, each of which highlights how the ideas behind works of prominent designers, including Sottsass, Colombo, Mari, and the Smithsons, have played out in the present. In the first room, the idea that the home is an inherently private space is challenged by projects such as Ugo La Pietra’s ‘Telematic House’ (1983), in which every piece of furniture has a built-in TV screen. Today, the domestic environment is not the closed space it once was. Smart speakers are always listening to our commands and our homes are full of high-tech devices that memorise and use our data. The implications for the private realm may be profound: if privacy is fundamental to the idea of home, how do new technologies affect the domestic environment as we know it? 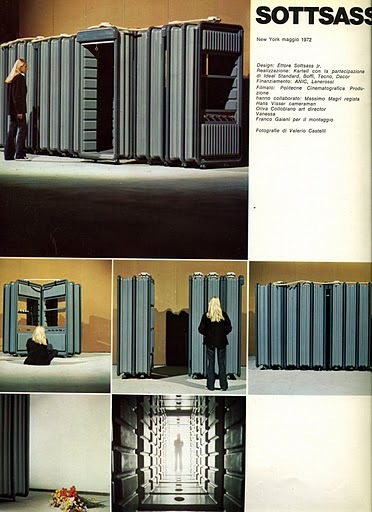 This section explores the concept of the home as a nomadic space, which was particularly popular in the 1960s and 1970s. Some, like Ettore Sottsass, designed modular environments that combined architecture with furniture to create more flexible living patterns. 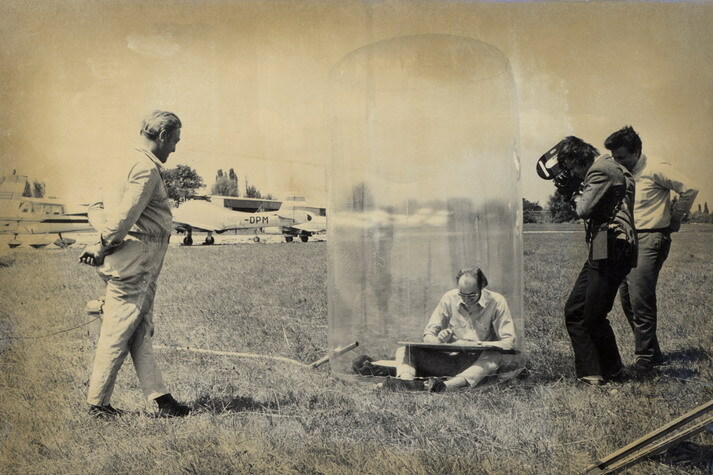 Others, like Hans Hollein, envisaged the home as an inflatable bubble. Today, the internet and our connected devices have made this type of nomadic living possible. Indeed, we live and work while moving seamlessly from one place to another, as long as we have Wi-Fi, and our ‘sharing economy’ is gradually removing the need to own many objects. The general idea of the ‘home of the future’ has long intrigued designers and popular culture alike. 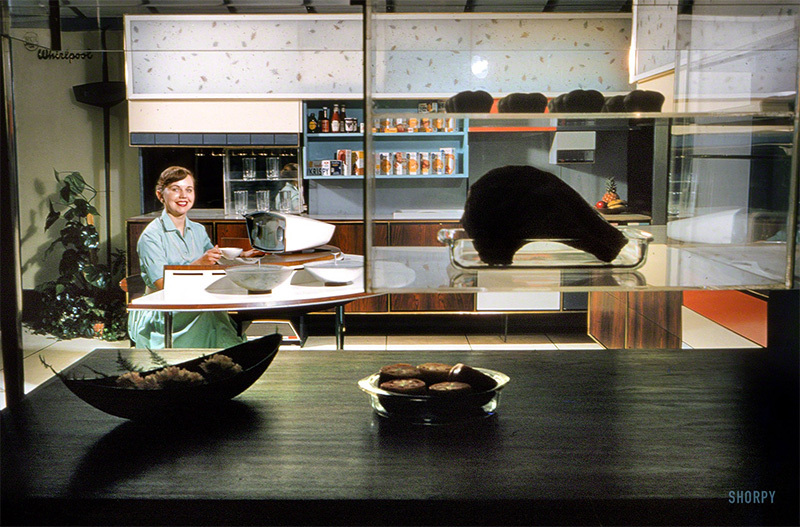 In the 1950s the predominant vision involved push-button appliances that promised to make housewives’ lives easier, like RCA/Whirlpool’s ‘Miracle Kitchen’ (1956), which envisioned a home controlled through a computer. Today, the vision has evolved into the ‘smart’ home: while the principles of labour-saving remain central, they are achieved by connected devices that store and use our data to predict our habits and preferences. Overpopulation in urban areas is the focus of this room. From the 1920s, the optimisation of domestic space became a matter of scientific study and resulted in hybrid furniture, such as the sofa bed. 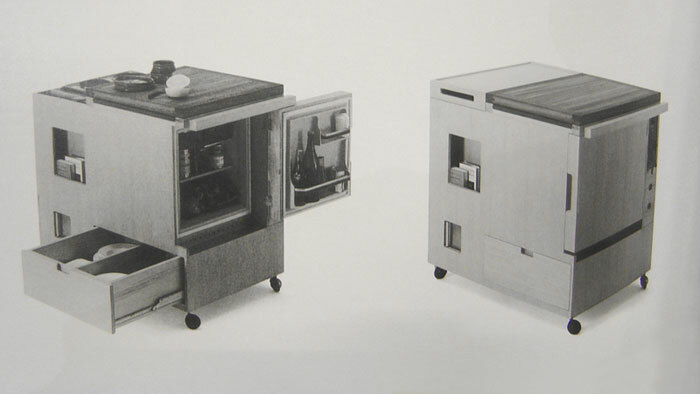 In 1963, Joe Colombo compressed the kitchen functions in his 1.5 cubic meter ‘Mini Kitchen’, later followed by the ‘Total Furnishing Unit’ (1972), which provided all the services of a home in a single piece of furniture. Similar thinking prevails in today’s micro-apartments, driven by the growing pressures on city living. 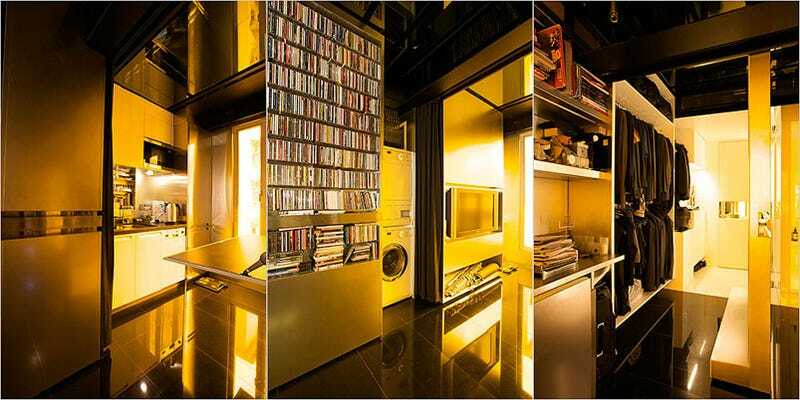 Gary Chang’s ‘Transformer Apartment’ in Hong Kong allows for 24 different layouts in a 344 square feet space. The 1970s saw a developing interest in the notion of self-sufficiency. To challenge consumerist ideals and help people become more self-reliant, designers created systems that would enable anyone to shape and personalise their home. Enzo Mari’s 1974 ‘Autoprogettazione’ manual demonstrated how to build your own furniture with just wooden planks and nails. 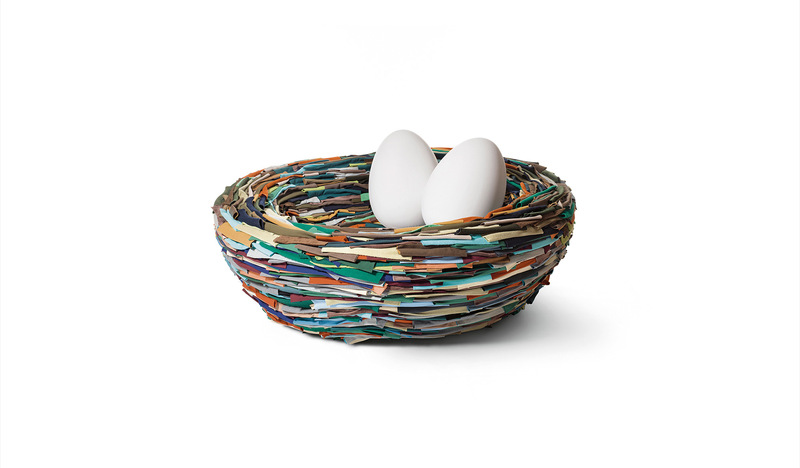 Due the overwhelming strength of consumerism in today’s world, more people are becoming aware of the need to find less wasteful ways to make, use and reuse domestic objects. Following in Mari’s footsteps, the OpenStructures project hosts an online platform where designers share their work, with a view to teaching people how to create their own household appliances. This last section questions the functionalist approach to the home, and instead explores the alternative idea that it is a place of organic forms inspired by the natural landscape. 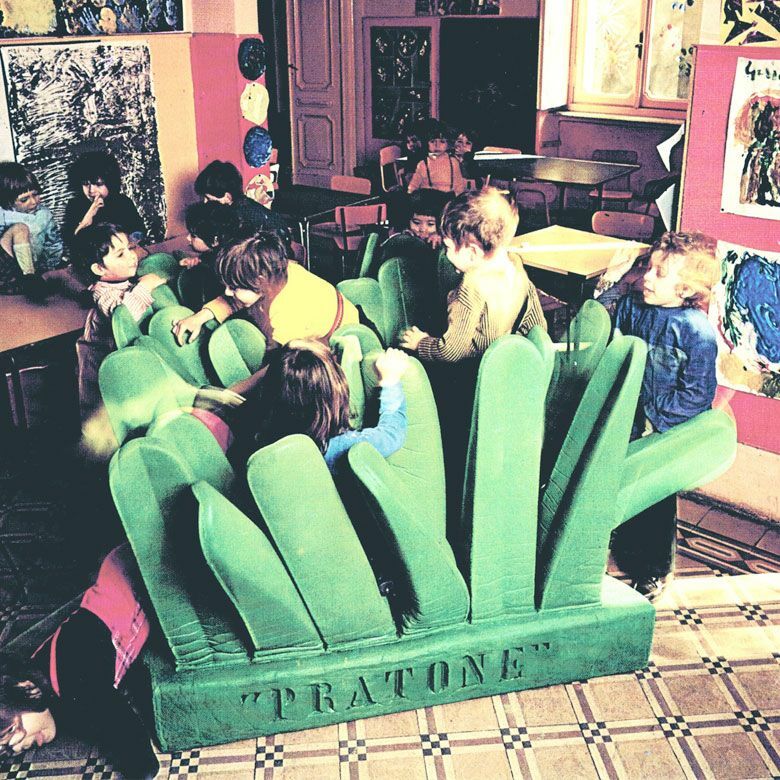 Giorgio Ceretti, Piero Derossi and Riccardo Rosso stray completely from domestic shapes with their joint work ‘Pratone’ (1971), a polyurethane lounge chair that resembles a patch of grass, with soft blades bending to your shape as you sink into them. Following this trend, Gianni Ruffi’s ‘The Nest’ (1973) reimagines the traditional sofa as a bird’s nest, evoking an archaic allegory of the home. Home Futures is a lively, interactive journey through a century’s worth of aspiration and imagination. By exploring the nature of our physical and psychological relationships with our homes, the exhibition encourages us to think about what all the technological progress in domestic living has been for. As we can see, the growing desire for convenience was accurately predicted by a number of these designers. Our homes are now more practical, efficient and technologically advanced than ever before. On the other hand, even though functionality has always been high on the list of priorities, it is worth remembering the extent to which our homes are not only responsible for our emotional wellbeing, but also expressions of our personalities. The exhibition, created in partnership with the Ikea Museum, runs until March 24th 2019 at the Design Museum.